By what age should my child be seen by an orthodontist? Do habits like thumb sucking cause a problem? Why should I be concerned about a bad bite or misfit of my teeth? Will braces interfere with playing a musical instrument? How often will I need office visits? Should I continue to see my pediatric or family dentist while I’m in braces? What are retainers all about? What if I do not wear my retainers? Will insurance pay for treatment? What is a malocclusion, and why should it be treated? Can I look for orthodontic problems at home? Besides a better smile, what else can orthodontics help with? 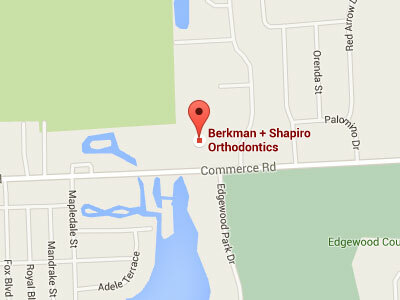 Dr. Berkman and Dr. Shapiro use fixed appliances (braces) which are among the most technologically advanced in the world today! Because of this, routine office visits for “adjustments” can be made much more infrequently. The vast majority of visits will occur every 6 to 10 weeks. In fact, even the total number of times adjustments need to be made is reduced because of the modern technology behind the systems we use. A malocclusion or “bad bite” is the term for teeth that do not fit together and function correctly. Most times, malocclusions are inherited. In some instances, they result from habits or functional problems like a tongue thrust. Cavities and early extractions of baby teeth can also lead to malocclusion problems. Whatever the cause, malocclusions are not good. At your consultation appointment, an estimate of total treatment time will be given. But remember, an estimate is only an estimate! Patients grow at different rates, and consequently respond in different ways to treatment. Dr. Berkman and Dr. Shapiro always have goals in mind, and will usually continue treatment until those goals are achieved. No, braces do not cause cavities. Cavities are caused by plaque, or accumulations of bacteria that form around food that is left on teeth. Braces can sometimes make it more difficult to keep teeth super clean, and it’s therefore important that extra special care be taken when brushing and flossing. With proper brushing, flossing, diet and the use of special fluoride rinses, cavities can certainly be prevented! Of course! Ask your child to open their mouth, and look at his/her teeth. If you see any signs of crooked teeth, spaces, or overlapping teeth, your child may need orthodontic treatment. Ask your child to bite all the way down, keeping the lips open so you can see the teeth. Do the front top teeth line up with the bottom? Do the top teeth protrude out away from the bottom teeth? Do the top front teeth cover more than 50% of the bottom teeth? Are the top teeth behind the bottom teeth? All these are indicators of potential orthodontic problems. Look at the alignment of your child’s jaw. Does the jaw shift off center when your child bites down? If you see any misalignment or shifting of the jaw, your child may have a skeletal problem, which may requires early orthodontic intervention. We'd love to hear your feedback! Help us improve our service by leaving a review. Please complete the fields below to leave us a review.